Scotland's most-capped prop Euan Murray will not feature at this year's World Cup after announcing his international retirement. The 34-year-old won his 66th cap against Ireland in March, the closing match of a Six Nations whitewash. Murray joined Glasgow Warriors last summer and is in talks with the Pro12 club about his future. "I am extremely proud and grateful to have represented the people of Scotland at rugby for so long," said Murray. "I will retire with many great memories of victories, tours, and friends, both in the playing squad and team management. "My wife Sarah is due our third child in August and I have to be with my family as much as possible before and after the birth. "Clearly, with the World Cup looming, the national squad will be training and playing throughout that period and I have too much respect for the national jersey to put myself forward in those circumstances. "I've made this decision now after much deliberation and lengthy discussions with team management so that they can plan ahead accordingly." Murray, who includes Northampton, Newcastle, Agen and Worcester among his former clubs, made his Scotland debut in 2005 and toured with the British and Irish Lions in 2009. A committed Christian, he has not played on Sundays since 2010. 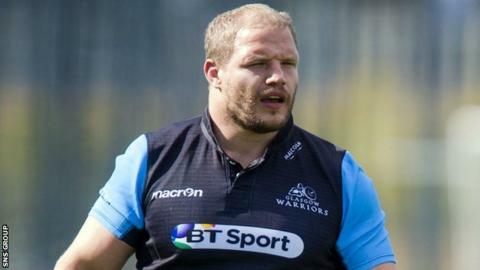 "At his best Euan was a world-class tight-head prop," said Scotland head coach Vern Cotter. "On behalf of the team and management I wish Euan and his family all the very best."